As early as the eighth century, elaborate Celtic crosses were erected as monuments throughout Ireland and Scotland. Since the Celtic Revival of the 19th century, the ornate designs have become a widely recognized symbol of Irish heritage. Our sterling silver necklace includes a small natural emerald at the center, framed in 14-karat gold. You can find emerald pendant necklace 'Celtic Faith' by National Geographic in jewelry categories such as Birthstone Necklaces, Celtic Necklaces, Christian Necklaces, Cross Necklaces, Cultural Necklaces, Nat Geo Europe Necklaces, Nat Geo Gifts Necklaces, Religious Necklaces, Emerald Necklaces, Silver Necklaces, Sterling Silver Necklaces and Pendant Necklaces. Enjoy exploring these sections for other Novica treasures. "Delicate and lovely. A charming keepsake." Very well done and delicate.charming. Tiny, Tiny....the pix do not indicate how small it is. 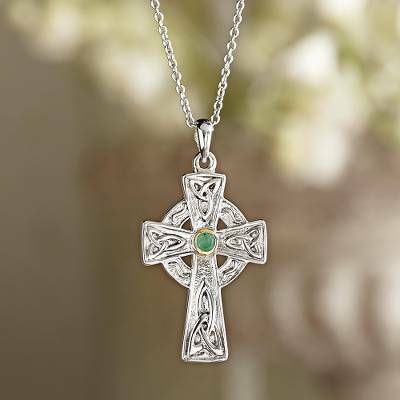 "Emerald pendant necklace, "Celtic Faith" 2002225"
This necklace is laughable at $109.95, the material of the cross looks as though it would bend quite easily and chain not very sturdy just cheaply made. Way too expensive for this piece. Id like my money refunded. Ill be returning the necklace immediately.